The MTR Corporation has come under fire after releasing a video last Thursday urging commuters with backpacks to be considerate of other passengers. The “Backpack Fighters” ad campaign. Photo: MTR video. The “fighters” include people who hit other commuters with their daypacks as they move around, and those who block the way of others with their bags even if they remain still. The video asks commuters to put down their daypacks in order to avoid causing inconvenience to other passengers. Critics accused the transport company of singling out people with daypacks. 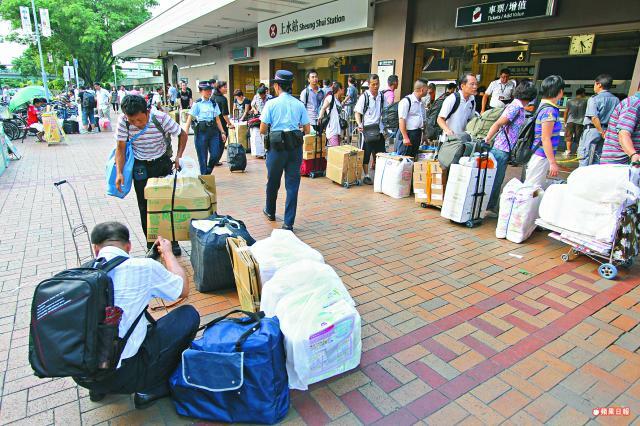 They questioned why it did not instead call out parallel traders – people buying goods in Hong Kong to resell in China, who often carry large suitcases and bulky goods on trains. Political commentator Yip Yat-chee said the heart of the issue is that Hongkongers lack manners on the subway, such as not using earphones while watching videos on their phones, blocking the doors, and clipping their fingernails on trains. Parallel traders outside Sheung Shui station. File Photo: Apple Daily. A satirical page called on the public to carry large suitcases in the MTR in protest. It alleged that the company turns a blind eye to parallel traders, and hence people with suitcases would not be targeted. Another Facebook page made an infographic, claiming that if the content of the “backpack” was parallel goods, it would be allowed on the train. Meanwhile, supporters said the campaign was well-intentioned. Some agreed that the issue of inconsiderate people with daypacks should be addressed. “The campaign is asking you to be considerate, not banning you from using backpacks. Why are you talking about switching backpacks to suitcases? 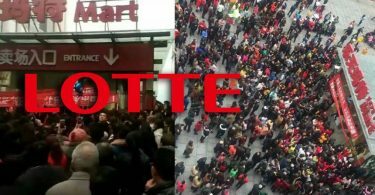 Stop dividing people,” one commenter said in response to the call for protests. 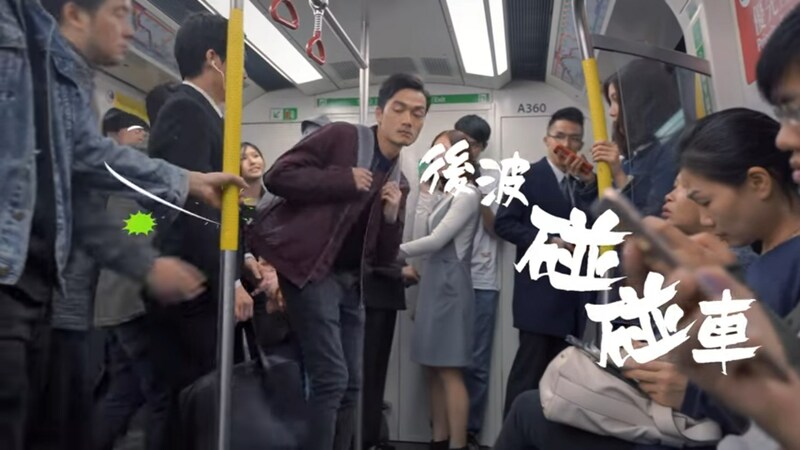 Frederick Ma Si-hang, non-executive chairman of the MTR Corporation, said on Tuesday that the ad campaign did not intend to upset the public. He called for tolerance to ensure a “comfortable” environment for all commuters. 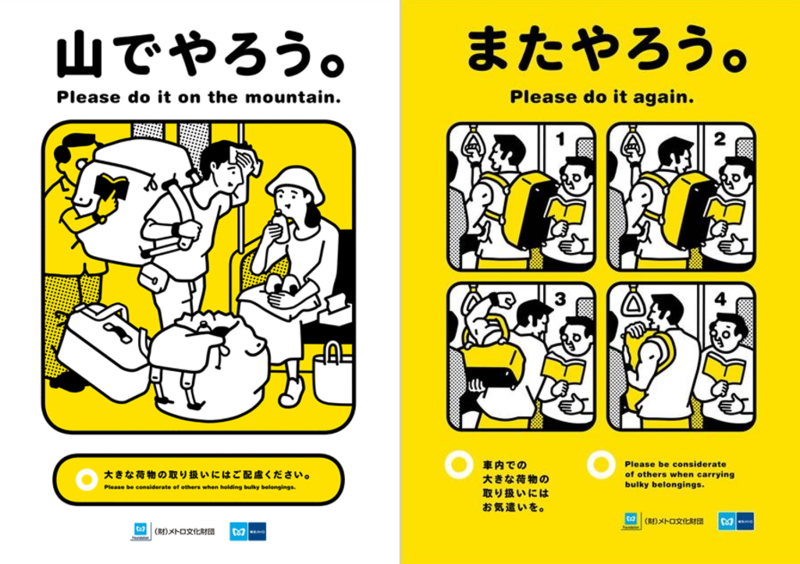 Tokyo Metro manner posters. Photo: Tokyo Metro. 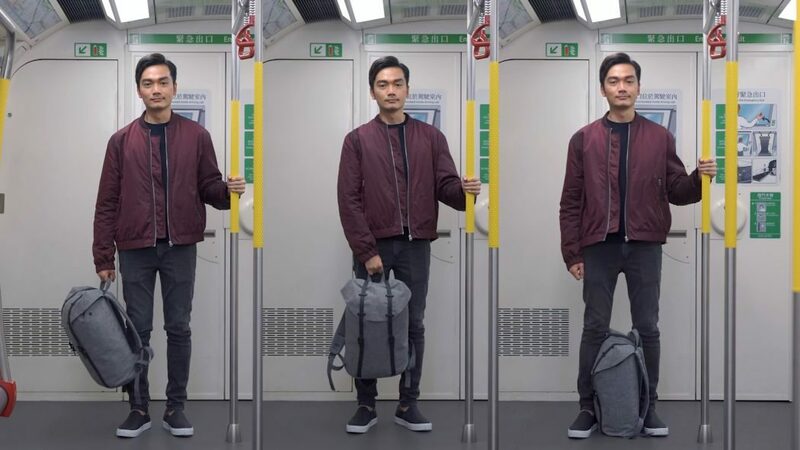 There are similar ad campaigns in cities such as Tokyo and Vancouver, though they focus on large backpacks, rather than regular-sized bags as shown in the MTR video. A spokesperson for the MTR Corporation told HKFP that some passengers asked the company to promote backpack etiquette. It considered overseas examples such as Paris, Japan and Singapore, which ran ad campaigns asking passengers to take off their backpacks.